Jenny has written seventeen books on wildlife gardening and her eighteenth book - The Diary of a Wildlife Gardener - is currently in preparation. Her most recent titles have been Butterfly Gardening, Making Garden Meadows, and Making Wildlife Ponds with the natural history publisher Brambleby Books. Her books are available in Waterstones and on Amazon. To buy signed copies of Jenny's books please contact her. See prices below. Two new books are in preparation. The series of iBooks - called collectively A Year in the Wildlife Garden - are available to download on this LINK. Since 2016 was heralded a poor year for butterflies, the publication of this delightful little book is very timely. Furthermore, the State of UK Nature Report highlighted the significant national decline in most butterfly species. The reasons for the decline are complex and include such things as loss of natural habitat and changes in agricultural policy. These very facts highlight the importance of gardens, however small or urban, as reservoirs for butterfly larval food plants and nectar feeding adults. To the gardener, there is the reward of seeing colourful insects and the assurance that if these are surviving so will other wildlife. The author adopts an engaging, informative style throughout the book, with a logical arrangement as well as content of the chapters. The introductory chapter is particularly enlightening as it provides a balanced insight into the desirability of gardens for wildlife, set against what might realistically be achieved. The all important location of the garden in terms of its north/south position and proximity to adjacent wildlife habitat give the reader useful goals. The reader is then treated to a brilliant account of the life cycle of butterflies, drawing a distinction between migratory species and those reliant on gardens throughout the year. The common species are well described, with helpful quality in situ photographs to identify them, together with accounts of those species less frequently associated with gardens, which can be an added bonus if they are found. 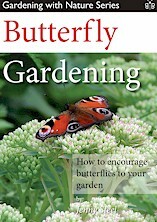 The next step is to provide detailed, practical advice on how to make a garden more butterfly friendly by the provision of shelter, especially in winter, and appropriate plant species for feeding. The latter must include those species which provide nectar for the adults, but also those which sustain the butterfly during its much longer larval stage. Here again, useful summaries are provided together with a crystal clear table of the butterfly year. An added bonus to this compact little book is that moths are included, since their requirements are often similar to their more glamorous close relatives. I found this book a joy to read and a gold mine of information. It should be considered a ‘must have’ for those gardeners who are keen to do their bit for nature and, in so doing, learn so much about these fascinating insects. This compact book exudes the enthusiasm of the author and is both an excellent read as well as a useful handbook. The reader is treated to an authoritative, yet engaging, guide to the various ways of introducing wild flowers into a garden, regardless of its size or condition. What is truly commendable is that the author does not gloss over the underlying science or the chances of success. One consistent message emerging from this and other books on the subject is that a wildlife garden involves far more than merely scattering of a packet of seeds! Both time and commitment are significant ingredients to ensure success. The book tracks the life of the author from a childhood where gardening and the natural world were pivotal, through her academic career to the establishment of a succession of her own gardens into wildlife havens. The reader is tutored into understanding the different types of opportunity available, with the clear distinction made between the wonderful hay meadows, which we all love and aspire to own but which take tens or hundreds of years and very careful management to develop, to the areas which we are able to create in our own garden. Another important distinction is made between a long-lived wildflower meadow of perennial plants including a high proportion of grasses and a wildflower area, with annuals such as poppies and cornflowers, which are typically short-lived, unless managed in a particular way. The theme of the book’s chapters is firstly to assess the garden prior to any action and then to assess the various options available. Commendably, the author focuses on the type of soil and how to deal with characteristics which are at odds with the goals of establishing a meadow, such as high fertility. She then describes the methods which can be used and the best time for the work to take place. As is often the case, time spent on preparation reaps its rewards! Lastly, the long-term maintenance of the area is discussed, depending on the nature of the wildlife haven that has been created. To complete the guide, there are useful summaries and suggestions of suppliers of wildflower seed together with further reading, even though the author has skilfully encapsulated all the main aspects in this book which, for anyone interested in improving their garden for nature, will prove a valuable purchase. 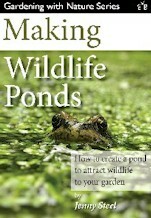 The third and last book in the excellent Gardening with Nature series by The Countryman’s wildlife gardening expert Jenny Steel is full of practical advice about how to create a pond to attract wildlife to your garden. Written by a noted gardener and ecologist, the book is divided into various sections, guiding the reader from the virtues of wildlife ponds, the importance of gardens as a wildlife habitat to creating, planting and maintaining ponds of all sizes down to those in containers. Chapters explore and profile the various types of wildlife to attract. Best line: Perhaps the most exciting thing about a wildlife pond is that you hardly need to do anything, except add water, to attract a variety of wildlife. 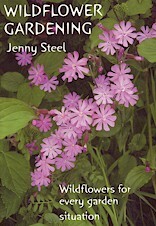 Jenny Steel has produced an attractive, informative and practical book that would encourage anyone to grow some wildflowers in their garden. Written in an easy-going style and packed with information, this book provides everything that the reader needs to know about gardening with our wonderful native wildflowers, whether to attract wildlife or simply for their own sake. If you thought wildflower gardening was too difficult, too specialised, or too much of a contradiction in terms, think again; this lovely book will guide you gently into a beguiling new world. It doesn’t matter what kind of garden you have, or whether your gardening style is hands-off or high-maintenance; there are wildflowers to suit every garden, and every gardener. Jenny Steel’s enthusiasm is infectious, and she is at pains to point out how easy wildflower gardening can be (though if you’ve seen her garden, you’ll appreciate the heights the skill can reach). 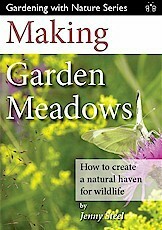 There’s no limit to what you can do with wildflowers – and this book is an excellent place to start. Jenny Steel and I share the same passion for plants and living creatures. But Jenny champions wild flowers (instead of garden flowers) and has done so for almost 20 years. In this lovely book she shares her expertise and depth of knowledge and in this age of lost habitats every garden should be fostering some native British plants to sustain our native wildlife.